On the 2nd Tuesday, of every month, we’re live on Twitter at 8pm (GMT) to facilitate a conversation about a topic related to mental health. 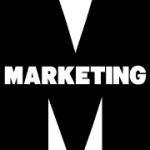 Here’s a round-up of our Twitter Chat: Social Media: Friend Or Foe? #blurtchats Social media can make me feel like a complete failure in my life, looking at how everyone else is living the dream. However, it also allows me to keep in touch with people. A real double-edged sword ?? 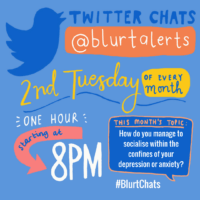 On the 2nd Tuesday, of every month, we’ll be live on Twitter at 8pm (GMT) to facilitate a conversation about a topic related to mental health. The best bit about a Twitter Chat, is that anyone with a Twitter profile can join in the conversation. And because it’s live, the hope is that it’ll be a buoyant hour which will be jam-packed with discussion, connection, advice-sharing and empathy. 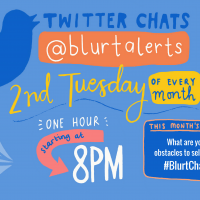 #blurtchats We Asked: What Are Your Obstacles To Self-Care? 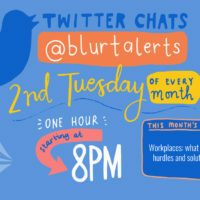 #BlurtChats: Workplaces: what are the hurdles and solutions?